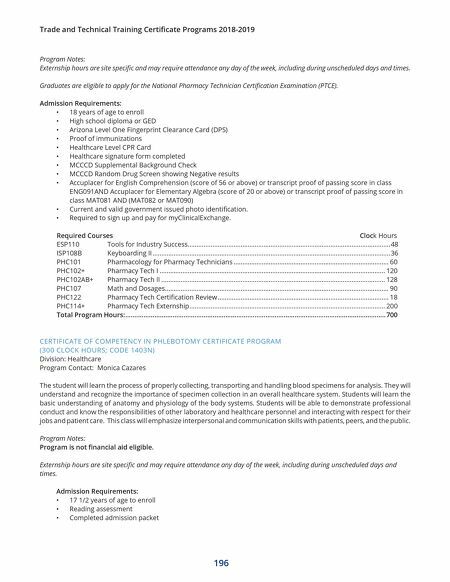 Trade and Technical Training Certificate Programs 2018-2019 195 CERTIFICATE OF COMPETENCY IN OPHTHALMIC MEDICAL ASSISTANT CERTIFICATE PROGRAM (700 CLOCK HOURS; CODE 1501) Division: Healthcare Program Contact: Ronda Mann The Ophthalmic Medical Assistant program will serve as your initial education program for learning and understanding the core level of care for entry into the fascinating world of eye care in a clinical/office setting. The program will focus on learning how to assist and work with ophthalmologists. Included will be an overview of patient services and even assisting with minor surgical procedures, instrument care and maintenance. Special attention will be given to complete comprehensive eye examinations, including chief complaints and history taking, anatomy and physiology of the visual system, eye terminology, general medical knowledge as well as hands-on skill instruction. Program Notes Externship hours are site specific and may require attendance any day of the week, including during unscheduled days and times. The Ophthalmic Medical Assistant program serves as a pathway to excellent job opportunities and a lifelong and challenging career with the future opportunity of becoming a Certified Ophthalmic Assistant (COA). 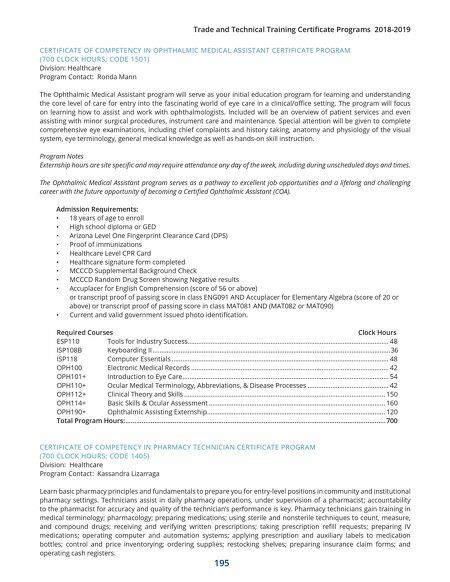 Admission Requirements: • 18 years of age to enroll • High school diploma or GED • Arizona Level One Fingerprint Clearance Card (DPS) • Proof of immunizations • Healthcare Level CPR Card • Healthcare signature form completed • MCCCD Supplemental Background Check • MCCCD Random Drug Screen showing Negative results • Accuplacer for English Comprehension (score of 56 or above) or transcript proof of passing score in class ENG091 AND Accuplacer for Elementary Algebra (score of 20 or above) or transcript proof of passing score in class MAT081 AND (MAT082 or MAT090) • Current and valid government issued photo identification. Required Courses Clock Hours ESP110 Tools for Industry Success .................................................................................................................. 48 ISP108B Keyboarding II .......................................................................................................................................36 ISP118 Computer Essentials ........................................................................................................................... 48 OPH100 Electronic Medical Records ................................................................................................................ 42 OPH101+ Introduction to Eye Care ..................................................................................................................... 54 OPH110+ Ocular Medical Terminology, Abbreviations, & Disease Processes .............................................. 42 OPH112+ Clinical Theory and Skills .................................................................................................................. 150 OPH114+ Basic Skills & Ocular Assessment .................................................................................................... 160 OPH190+ Ophthalmic Assisting Externship ..................................................................................................... 120 Total Program Hours: ............................................................................................................................................... 700 CERTIFICATE OF COMPETENCY IN PHARMACY TECHNICIAN CERTIFICATE PROGRAM (700 CLOCK HOURS; CODE 1405) Division: Healthcare Program Contact: Kassandra Lizarraga Learn basic pharmacy principles and fundamentals to prepare you for entry-level positions in community and institutional pharmacy settings. Technicians assist in daily pharmacy operations, under supervision of a pharmacist; accountability to the pharmacist for accuracy and quality of the technician's performance is key. Pharmacy technicians gain training in medical terminology; pharmacology; preparing medications; using sterile and nonsterile techniques to count, measure, and compound drugs; receiving and verifying written prescriptions; taking prescription refill requests; preparing IV medications; operating computer and automation systems; applying prescription and auxiliary labels to medication bottles; control and price inventorying; ordering supplies; restocking shelves; preparing insurance claim forms; and operating cash registers.